When we brought Callisto (Calli), Galileo (Leo), and Nova home, the girls were nervous but curious, whereas Leo was simply flat. When we picked him up, he was completely limp, and he seemed very depressed. These kittens were a well-behaved, trustworthy group that warmed up to us quickly, so although we’d started them out confined to the bathroom, we soon gave them a run of the house. They made good use of their freedom. 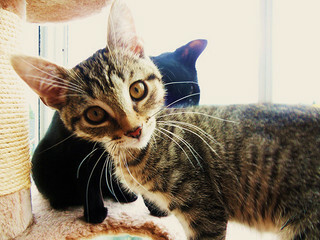 Leggy and built for speed, the kittens tore around the house like streaks of lightening. They were also a bright, clever group and very gentle. There was no biting or swatting, even from Leo, the scaredy cat. Leo slowly came out of his shell, though he remained depressed and timid. Our resident cats Freya and Smokey usually take on the role of foster parents to new kittens we bring home, and when they met this bunch, Smokey took a particular interest in sad little Leo. The two of them spent several hours each day cuddled together in the kitty hammock formed by a clothes drying rack we had in the livingroom. 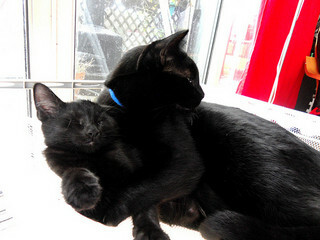 Smokey usually kept his arms wrapped protectively around Leo. With Smokey’s support, Leo soon came out of his shell and became a happy, friendly guy. 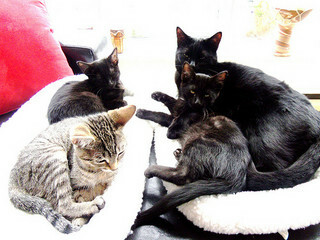 Freya took on a maternal role as well, and the three kittens or various pairings could usually be found on a cat bed next to her. 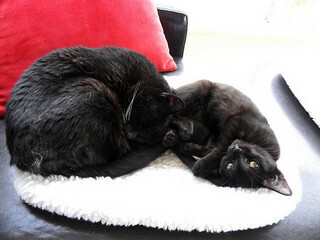 The kittens also took an interest in our twenty-one-year-old cat, Laya, who pretended to ignore them and let them sneak up and crawl into a cat bed with her. Kittens that were able to climb into bed with the matriarch were very pleased with themselves; apparently this was a huge victory in the kittiverse. 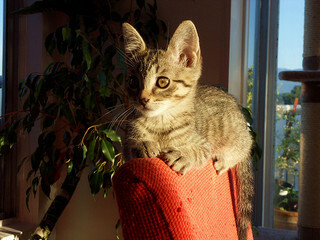 The kittens were healthy and good with their litter box from the start, so we were able to get their profiles up on the Vancouver Orphan Kitten Rescue Association (VOKRA) website soon after they arrived. 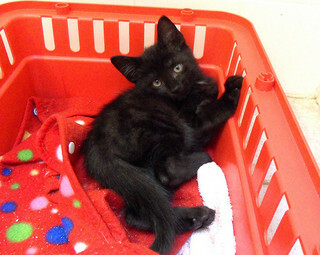 Taking good photos is important for capturing the interest of potential adopters, particularly with black kittens, because black cats are less likely to be adopted than cats of any other colour. 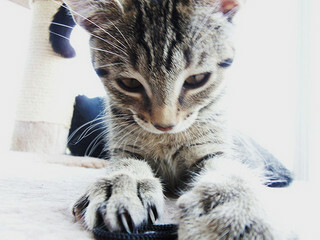 Nova was easy to photograph–she looked like an Egyptian Mau and was fond of striking artistic poses. Leo also posed on demand and had stunning amber eyes that looked amazing in pictures. Although she was a pretty kitten, Calli was a challenge to photograph because she moved at warp speed and never stayed still for more than a few seconds. She not only ruined nearly every photo I tried to take of her by moving, but took to photobombing my shots of the others. 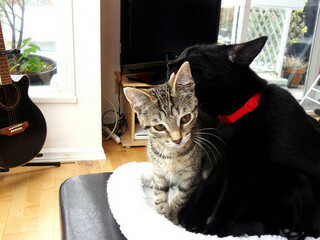 Eventually we got some good pictures and put the kittens’ profiles up on the site. Although VOKRA was awash in floods of kittens at that time of year, it didn’t take long before someone came to see Nova and adopted her on the spot (we’ve found that people who come to see kittens nearly always adopt them; when they don’t, it’s typically because they’ve lost a beloved pet and decide that they aren’t ready to take on a new one, which is really too bad because caring for a new pet is the best way to move beyond the grief of losing an animal). 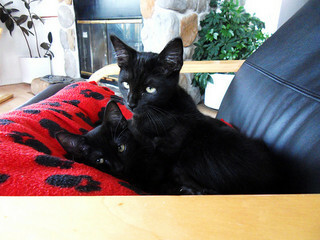 Calli and Leo took longer to attract the notice of potential adopters because they were two more black cats in a sea of black cats. 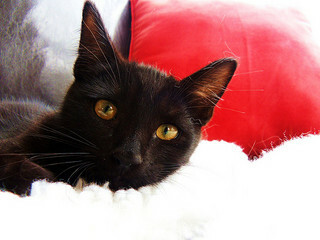 The gingers, whites, grays, tabbies, and Siamese blends tend to be snapped up while the black cats are overlooked, despite research indicating that black cats tend to have the best temperaments. This was certainly true of Calli and Leo, who were bright, sweet, and playful. 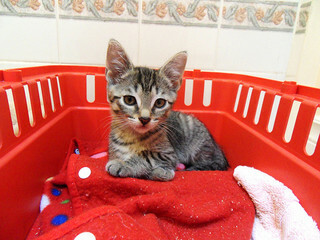 Eventually we got a call from a potential adopter who had been so impressed with the kittens’ profiles and photos that she’d adopted them before even meeting them. She had already stopped by VOKRA headquarters, paid the adoption fees, and filled out the paperwork when she arrived with a carrier to take them home. Nova has come to visit once since her adoption. We babysat her while her owner went out of town for a couple of days. She grew up to be a real beauty with a slender build, a spotted belly, and striking eyes. We received an update on Calli and Leo from their new owner, who let us know that they were doing well in their new home, and that Leo loves taking baths in the bathtub; he actually lies back and relaxes in a shallowly filled tub like a person. 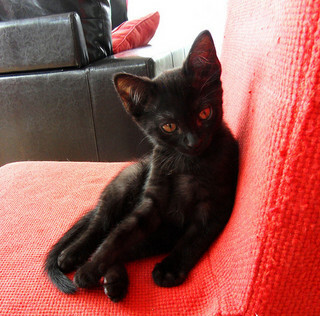 We always knew that he was an odd little guy, but the odd kittens tend to be the most interesting ones.